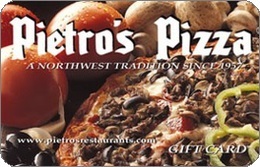 Pietro's Pizza has been a Northwest Favorite since 1957. Pietro's famous original thin crust pizza is made using Pietro's secret recipes which produce the flavor and texture that you are sure to enjoy. Pietro's tops our pizza with real cheese and the freshest and finest ingredients available. For balance inquiries call the phone number to a Pietro's Pizza's location below.